I don’t know about you, but after a long holiday weekend of overeating, I was craving a big salad. But step away from that bottle of dressing! One of the easiest things to make is homemade salad dressing. Many bottled dressings are filled with preservatives. 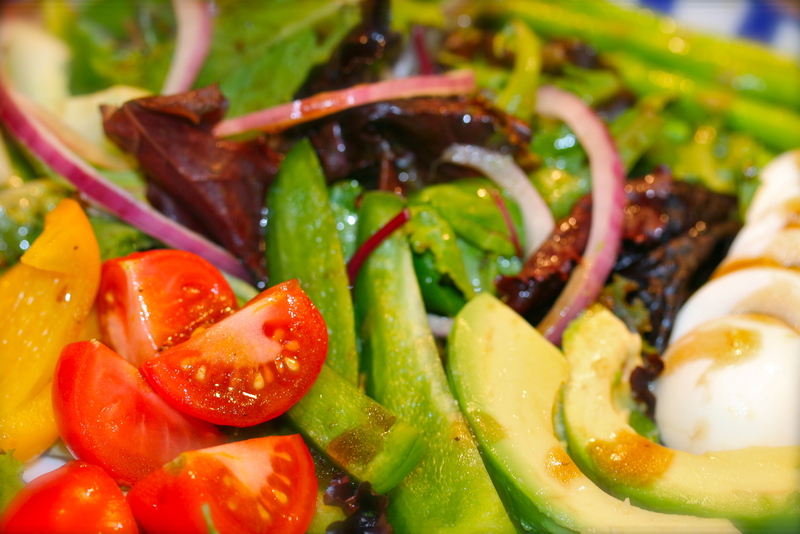 Here is an easy recipe for my balsamic dressing. This recipe makes about a 1/4 cup. It doubles nicely as well. In fact, I will often make a batch of this so it’s ready in the refrigerator for a couple of days. It’s also delicious drizzled over grilled vegetables or even on sandwiches. We love it with a prosciutto and mozzarella panini or a mozzarella, tomato and fresh basil sandwich, too. It’s a simple dressing that everyone will love. Put all the ingredients in a bowl, except the olive oil. Whisk together, then slowly drizzle in the oil to emulsify the dressing. Taste to reseason with more salt or pepper as needed. * Another easy way to make homemade salad dressing is to put all the ingredients in a small air-tight container, snap on the lid and shake like crazy. No whisk needed. Although Thanksgiving is my favorite holiday, I think I might enjoy the leftovers even better than the meal itself. There’s something about grazing in the refrigerator at midnight after everyone is gone, the dishes are done and you’re exhausted. I think the food sometimes just tastes better. I like leftover turkey two ways, a hot turkey sandwich like you get at a New Jersey diner with good bread and rich gravy and a cold turkey sandwich… like a good Jersey diner. Every time I order a turkey club at a Jersey diner the turkey is always fresh, not that nitrate filled deli stuff. Always yummy! 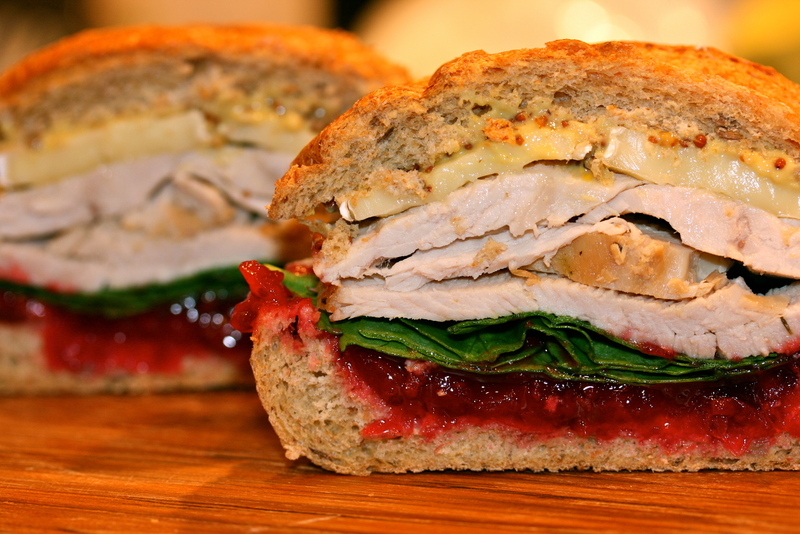 We roasted a boneless turkey breast the other night, because I wanted to come up with some Day After sandwich ideas. The recipe for the turkey is below. 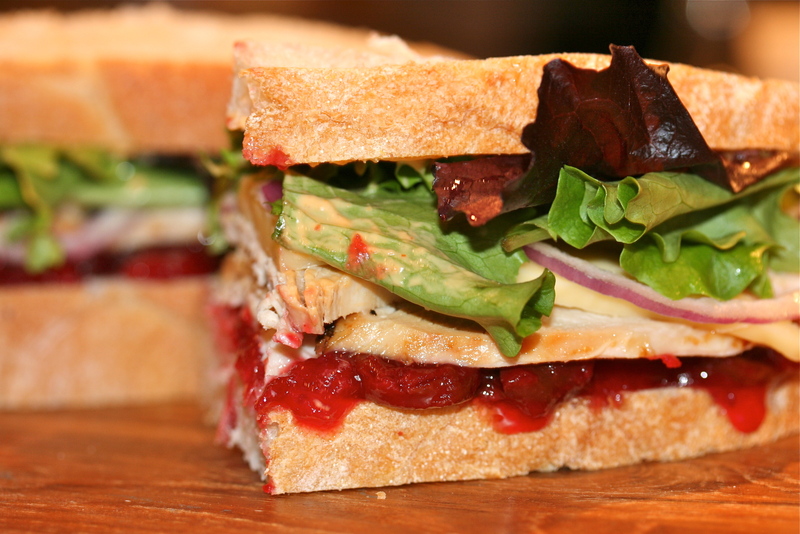 I had just made a batch of cranberry relish and it made me crave a good turkey sandwich, and they were so good! I think we all have our own version of the Day After Thanksgiving sandwich. When I was growing up it was always turkey, stuffing, cranberry sauce and Hellman’s mayo on rye bread. Delicious as that combo is, I wanted to try some more exciting combinations for fun. I avoided the double dose of carbs and didn’t include the stuffing. My husband would argue that the quality of the bread makes the sandwich. I might counter him in this case and say that the condiments make the sandwich. 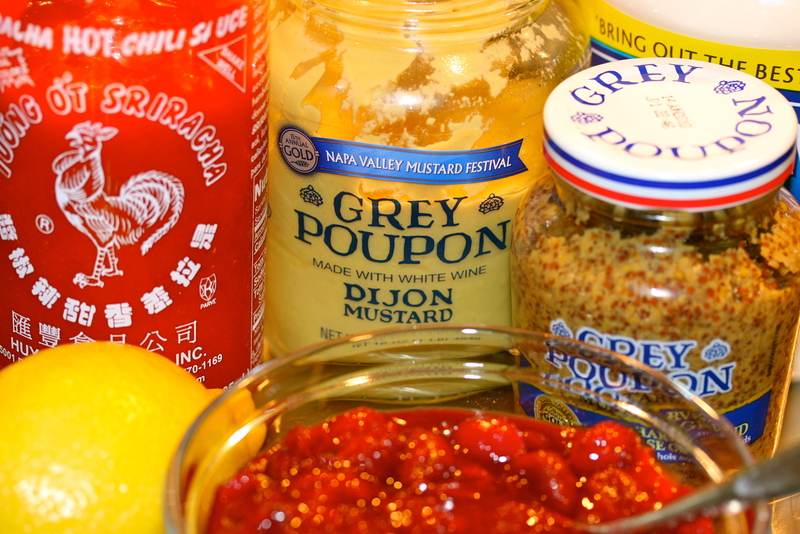 I urge you to run and get yourself some Sriracha hot sauce and whole grain mustard, so you will be ready for your Day After creations. French cheese, French mustard, French bread… what made this sandwich delicious was the flavor combination of the two mustards with the tangy brie and cranberry relish. I love the pop of the mustard seeds. Here I used whole grain french bread rolls. This was definitely my husband’s favorite. If you like spicy food and haven’t tried Sriracha hot sauce you’re in for a treat. I’ve included my mayo recipe below. I love Sriracha! The spicy mayo with the tangy cranberry relish was amazing. Gouda is creamy and mild, a perfect balance to the other intense flavors of this sandwich. I’d like to make this again on a French baguette, although the Italian boule was a good match. Easy, spicy and delicious on truly any sandwich. This would be especially good slathered on a grilled chicken sandwich. Put all the ingredients in a bowl, whisk together and enjoy! I wasn’t originally intending to post how I made the turkey, but I was surprised at how easy it was to roast a boneless breast. I had only made bone-in turkey breast in the past. The boneless breast was easy to slice up for sandwiches. Now I think it’s the perfect alternative to buying deli turkey. I was fortunate that the market cut it in half for me, so I didn’t need to buy a 6 pound breast. That would be a lot of sandwiches! Preheat the oven to 425 degrees and rub a sheet pan with a little olive oil. Rub the breast all over with olive oil and sprinkle generously with Herbes de Provence, kosher salt and pepper. Roast in the lower third of the oven for 1 1/2 hours or until it reaches an internal temperature of 165 degrees. Let it rest, tented with foil for 10-15 minutes before slicing. So simple!